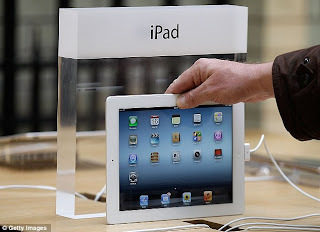 This is exciting news for everyone who loves and coverts the apple iPad but can't afford it. In as much as some people opt for cheaper brands like Asus, Galaxy Tab etc, I think people's first choice still remains the Ipad. Apple is to launch a smaller, cheaper version of its iPad tablet soon, according to sources within the Far Eastern factories that supply the technology giant. The new machine will be less than 8 inches across the diagonal - considerably smaller than the current 9.7-inch model. It will also be cheaper, to compete with rivals such as Google's £159 Nexus 7. The unnamed sources in Apple's supply chain said that the launch is 'very near'. Sterne Agee analyst Shaw Wu predicts that the move would be a devastating blow for Android competors. The iPad Mini would show that Apple is prepared to break away from former chief exec Steve Jobs' deeply-held mantras who was totally against a smaller iPad.